Collagraphs are prints made from a collage. The term refers to an experimental form of relief printmaking and was coined in the 1950’s by artist Glen Alps, a printmaking professor from the University of Washington in Seattle. The word is derived from the Greek word koll or kolla, meaning glue, and graph, meaning the activity of drawing. In making a collagraph plate, many layers of diverse material, from cardboard and glue, to wax, string and plaster are applied to a printing plate or substrate. The plate can be made of cardboard, wood, plastic or most anything else! Using a type of sand called “carborundum” allows the plate to hold more ink and creates varying tones and soft, velvety areas of deep, dark color. In preparing the printing plate, the artist works with an eye toward creating different surface levels and textures in which to hold ink that will later be transferred to paper with a printing press or by hand. The interest in using recycled and found materials has generated a resurgence of this open-ended process that lends itself well to abstract art and experimentation with pattern, texture and paper embossing (creating a pressed shape into the paper with or without ink). I find it complements my jewelry making with my ongoing interest in surface textures, rich colors and bold patterns. I love this process because there is almost no way to fail if you keep an open mind and are curious about the way any given material might hold ink or leave random and unexpected marks. One of the finest books on the subject is a small edition, Collagraphs and Mixed Media Printmaking by a wonderful pair of collagraph artists, Brenda Hartill and Richard Clarke. 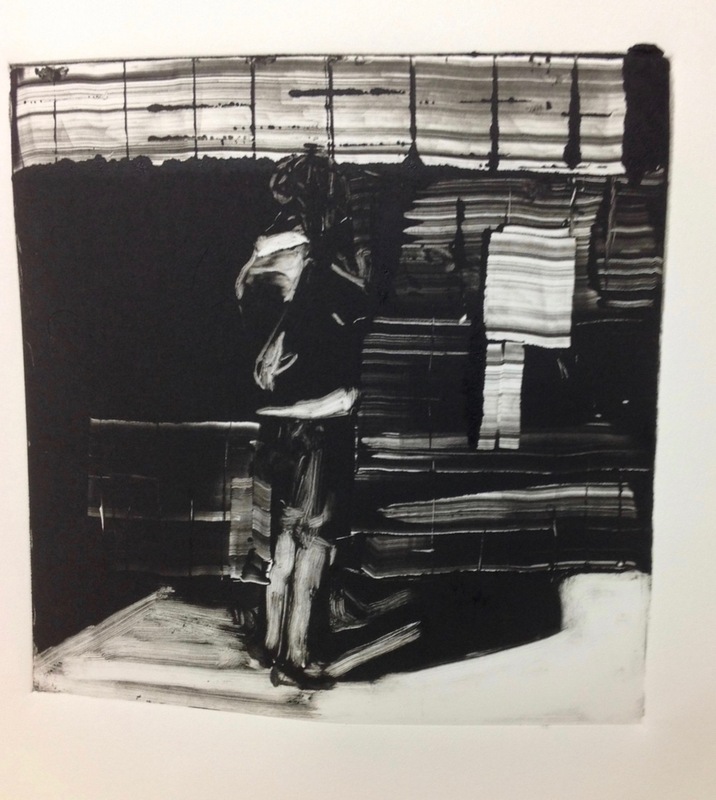 Monotypes are pulled impressions that were drawn or painted on a metal or plexiglass plate. The images are created through applications of ink that are rolled, brushed, daubed or otherwise applied and manipulated and then, with the material, usually paper, that is to accept an impression, are "pulled" with the use of a press. Monotypes are inherently unique because only one or two impressions may be pulled before the ink is used up. Although there may be a second impression, it is quite different from the first in that most of the ink was lifted from the plate in its first pass through the press. The second impression, called a ghost or cognate, is much lighter or thinner and is more of a suggestion of the first. Each pulled impression may be considered a finished work or it may be further enhanced by the application of additional drawing or color.. . . recent experimentations in the use of inks mixed with various viscosities of oil, applied in multiple layers on the same plate prior to printing have produced complex and exciting impressions. When technically well-executed, monotypes created in this manner are distinctly monotypes in their incredible fidelity to the artist's manipulations of ink, but have a remarkable transparent and "layered" quality that is not otherwise achievable. Check out my print gallery here.